"Now that Apple officially unveiled their 970MP, IBM began to communicate freely about this CPU. That's why we learn in http://www-03.ibm.com/chips/news/2005/0707_power.html a communiqué there now are low consumption PPC 970FX. Two models exist, a 1.4 GHz G5 consuming 13W and another 1.6 GHz consuming 16W. Those are typical, but not maximal consumptions. "Those who feel that Apple was too quick to abandon PowerPC will find there some argument to feed their resentment...."
"I've been loving my new iBook G4. It's much faster than my previous iBook (800 MHz, G3 processor), is way quiet, and I love having a faster wireless connection. First, the minor one: some CDs just won't play correctly. This includes both audio CDs and install discs. If I copy the discs to a CD-R, then all is well. For example, I tried to rip a ColdPlay album to iTunes, and iTunes wouldn't play the disc or import anything. The copied disc, however, was fine. Now for the big one. Within days of getting the iBook, which came with OS 10.4.2, I connected it up to my 160 GB Fantom Drive via FireWire to do a backup. I slept the computer after unmounting the drive and took the iBook back upstairs to my office. It wouldn't wake up - instead, I got the black screen of death, in which the computer is in a sort of zombie state. If I hit the Num Lock key, it lights up, but the screen won't come on, and nothing will either wake it up or put it back to sleep. Doing a restart doesn't work either, at least on this iBook - I had to either remove the battery or hold the power button down to do a forced shutdown. "It finally occurred to me that this was only happening when I would disconnect my iBook from a second monitor. I should also add that I span across both monitors using Screen Spanning Doctor, version 0.3.3 (the latest, which is Tiger-compatible). I'd used SSD for probably 2 years on my previous iBook and loved it...."
"Apple has finally coughed to the existence of a glitch numerous PowerBook G4 owners have been pointing out for months. "Says a recently published Apple Knowledge Base entry: 'Some earlier PowerBook G4 computers that have a SuperDrive with a 2x [sic] DVD-R write speed may not be able to burn 8x DVD-R media reliably. Because of this, you should only use 2x or 4x DVD-R media.'" "The marriage of notebook PCs and televisions may be at hand thanks to a trend toward increasingly larger and wider LCD panels in portable PCs. "Wide aspect ratio LCD screens, such as the 15.4-inch panel, have been appearing in many notebook lines for consumers and corporations for several years. But now, thanks to increases in both the numbers and sizes of wider panels available, wide-screen notebooks are could begin out shipping standard screen notebooks as soon as the middle of next year, a new report by International Data Corp. says." "PowerBook G4/1.5 GHz 12" vs. iBook G4/1.42 GHz 14"
"This one is a bit of an eye-opener, especially for those pondering which of these machines would make the best choice for their next system upgrade. "You can read the article for the full story, but despite its 6% faster CPU/cache speed, 18% faster system bus, 100% more Graphics memory, and 29% faster hard drive, the 12" PowerBook tested 21% slower in GPU performance, 52% slower in graphics interface response, 36% slower in graphics gaming, and offered 46% less running time per battery charge. Where it soared ahead was in hard drive performance - 67% faster." PowerBook G4/1.5 GHz 12" Compared to the iBook G4/1.42 GHz 14"
"The only one big thing missing: competition beating performance. But we get it. This revision is about refinement. (Yawn)"
"PowerBook and iBook batteries, like all other lithium-ion charge carrying devices, have a limited life-span. After several months to a few years of use (dependent on the number of power cycles), the batteries will start carrying a smaller charge, causing the PowerBooks' usage time to dissipate quickly when not connected to external power. "Eventually, you may find that your two to three year old PowerBook/iBook lasts for an hour or less - in some cases, going to sleep immediately when disconnected from the power adapter. "Unfortunately, this behavior is inexorable for lithium-ion batteries. As soon as they leave the manufacturing facility, they are prone to gradually lose capacity as time progresses, whether they are stored or used actively. However, we've gathered a few tips that can help extend the life of your battery, as well as potentially regain some lost capacity for older units. Try them before you buy a replacement." "Sometimes the Ethernet port on a PowerBook G4 (Double-Layer SD) may not work properly when the computer is running on battery power and has just woken from sleep. If this happens, put the computer back to sleep and wake it up again to resolve the issue." "If you try to play a DVD-Audio disc after waking your PowerBook G4 (Double-Layer SD) computer from sleep, the disc may not play properly. It may appear to be playing, but you don't hear any audio. If this happens, just eject the disc and reinsert it; you should now be able to hear the audio." "With the PowerBook G4 (15-inch Double-Layer SD) and PowerBook G4 (17-inch Double-Layer SD), you have the support of Safe Sleep, which ensures that data stored in main memory will not be lost should the system shut down due to a loss of power during sleep mode. Prior to your system entering sleep, Safe Sleep automatically saves the contents of main memory - such as desktop settings, open applications, and other work in progress - to the hard drive. In the event the battery becomes completely depleted while the system is asleep, the computer will shut down. But when a power adapter is connected or a freshly charged battery is installed, the PowerBook can be restarted and it will automatically return to the desktop state that existed prior to entering sleep. This means that applications and files will remain exactly as they were prior to the system being put to sleep, making it easy for you to continue on with your work." "Starting with the PowerBook G4 Double-Layer SD models, the sleep indicator light in the lid button has a new behavior during startup. "When you first press the power button to turn on the PowerBook G4, the sleep indicator will also turn on. As the computer starts up, the indicator stays on until the display turns on. You can use this light as a diagnostic visual to determine whether the computer is getting power at startup." PR: Compact, lightweight, and extremely portable travel charger for use in a car, boat, or airplane. 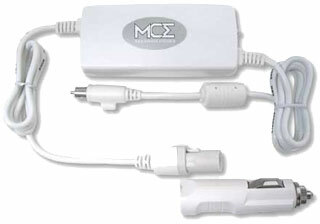 Simultaneously provides power to PowerBook or iBook and charges the computer's battery! Ruggedly built for long lasting service. Compatible with all PowerBook G4 (12", 15", 17") and all dual-USB iBook (all-white, 12" and 14"). For use in any standard cigarette lighter socket (auto, airplane, etc.) or airline EmPower socket. PR: GlobeTrotter Combo Edge is the ultimate solution for PowerBooks to provide a fast mobile Internet connection from virtually anywhere in the world with support of 850, 900, 1800, and 1900 MHz networks. GlobeTrotter Combo Edge supports EDGE connections with up to 236 kbit/s download speeds and up to 116 kbit/s upload speeds as well as fast GPRS connections with up to 53,4 kbit/s download speeds and up to 26,8 kbit/s upload speeds. Mobile High Speed will completely configure your Mac OS X system to use a EDGE or GPRS online connection provided by your mobile network carrier with no pain of searching for such interesting information like APN number, connection parameters and modem scripts. The supplied Mobile High Speed 3G software includes more than 250 connection settings for most mobile network operators worldwide. Price approximately $410 at current exchange rate. PR: ATP Electronics Inc., a global manufacturer of digital flash media products, has announced the release of its rugged USB ToughDrive. The unique, road worthy ToughDrive is a high speed USB 2.0 flash drive that is stylish and functional, featuring a durable rubber housing that is both water and shock resistant. Available today, the ToughDrive family begins at 256 MB and offers capacities up to 2 GB, and can be partitioned and password protected for secure storage. ToughDrives also feature a high performance 30 /s data transfer speed for faster file transfers and seamless multimedia streaming. The ToughDrive data transfer speed of 200x or 30 /sec is designed for high quality multimedia streaming which yields less lag time for file transfers. Using the same high quality flash components as ATP flash cards, the ToughDrive also offers a read and write lifetime ten times longer than other standard USB flash drives. PR: Casting light onto the difficult expanse of computer power management, Sleep Monitor helps you audit and better understand your Mac. This software monitors and profiles your Mac's energy use, and can help you identify power management problems. With Sleep Monitor you can easily build an energy profile spanning days, weeks, and months. Your profile will contain a record of all the power events, battery changes, and energy state information. With your profile and Sleep Monitor's reporting application you can see the battery level as it rises and falls over minutes, days, and weeks. Charted in a beautiful graph, the battery information is colour coded; a green line for when your battery is charging, and an orange line for when it is discharging. With the increasing focus on the environmental cost of our lives it is essential to measure and understand our energy needs. Sleep Monitor provides the easiest way to audit the power use of your computers. Sleep Monitor demands nothing of you. Once installed the background monitors quietly build your energy profile. This design makes Sleep Monitor ideal for helping your business or school to better understand the cost and usage patterns of your Macs. Supports Mac OS X 10.3.9 and above. PR: MiniBatteryStatus is a small Dashboard widget that monitors battery status, charge percentage, and remaining battery life. Integrated with Growl to alert you when it's time to recharge your battery.